Operation of wind energy plants can be encumbered under certain conditions by the formation of ice on the rotor blades. Because this heavy ice presents a danger as it can be slung over 100 meters, the plant must be shut down upon detection of ice. Often time is lost before a restart is possible. LCM has developed a new system that enables minimum-effort measurement of icing directly at the rotor blades and avoids down time. This system is based on Radio Frequency Identification (RFID), a technology that has been used successfully for years in industry and logistics. Small tags without batteries are mounted at locations on the rotor blade that are at risk of icing and the tags are read remotely via radio waves. This normally works only over short distances and with quasi-stationary targets. Selection of specialized components and adaptation of reading algorithms enables the system to handle wind energy plants with distances of 10 to 15 meters between mast and rotor blade and speeds over 200 km/h. The tags are mounted at various positions on the blade (front, back and edge). In the event of icing, the ultra-high-frequency field required for reading is weakened. Thus in real time the condition of the blade can be inferred at each respective tag position and so a decision can be made whether the plant can be restarted. Previously controls could be done visually only, which can be difficult and time-consuming due to the exposed and remote location of such a plant. 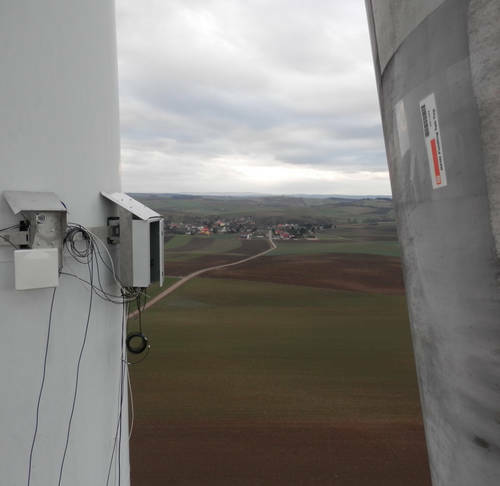 The prototype of the ice detection system, developed in close cooperation with the Austrian plant construction firm Hainzl, has been installed since last winter in a wind farm in Simonsfeld. This year, in cooperation with Hainzl, additional European wind energy plants will be equipped with the system in order to test performance with respect to ice thickness measurement. The ice detection system, developed within nine months by three LCM staff members, has meanwhile been patented internationally.